My shock and horror at losing Ho Ho Cleaners got me thinking about what commercial rents actually are around here. I figured landlords were asking too much, but I really had no idea what the difference in commercial and residential rents are. I have a better idea now. The two storefronts that sit just one block up from my beloved Ho Ho want $3000 per month for each space. The landlord suggested that a barber shop or fortune teller might work well in the spaces. When I suggested a tutoring center, he said that wouldn't make en ough money. I guess fortune telling is more lucrative than I thought! By my unscientific estimate, those two store fronts have been available for close to a year. 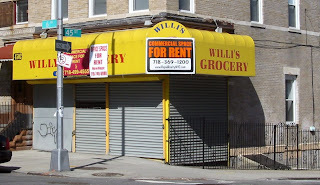 If approximately 450 square feet with a working bathroom and white paint job are what you want, call 347-424-3147. Both are still available. On 6th Avenue and 45th Street, there's a storefront that has been available for a couple of years. Well, that's not entirely true. It looked like someone had rented it because clean-up was in progress for a while and a new awning went up. They cleaned out some nasty looking stuff. However, it didn't open. I never got a call back about the price, and the agent to whom I spoke couldn't find the listing. Hmmmm. That might explain why it hasn't rented. Or, maybe there's something nefarious going on with the building. I love intrigue. As the photo shows, it's listed with three separate agencies, yet it still hasn't rented! Looking it up on the RapidRealtyNYC.com site, I found a listing for a space "ideal for a cafe" that was listed on 7th Ave and 46th Street. Maybe they got the location slightly off? It was listed for $1900. Then again, it's described as being on a commercial strip, so probably not. This has another grocery across the street and a laundromat one block up. However, I too think it is ideal for a cafe. Coffee and sticky buns by day, wine bar and tapas by night? C'mon somebody! Step up! It's probably less than $1900 because it's not on a commercial strip. Basically, there are quite a few deals to be had, but the locations (under the Gowanus?) 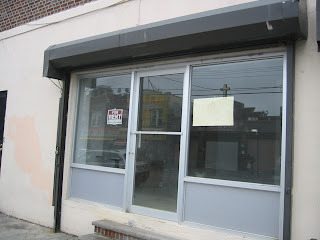 and conditions of the storefronts are pretty sad. Based on my 90 minutes of research, it sounds like my friend on 8th Avenue with the two storefronts doesn't really want to rent out the spaces. Those are Park Slope prices. Or maybe he's holding out for good fortune. I just can't wait to find out what the new rent for Ho Ho will be. You KNOW I'm calling them to find out. Wow. It was $2300 just 5 weeks ago! I can't help but think it makes money as a loss for the owners. There are so many store fronts on eighth and seventh that have been empty for too long to justify these rents. Thanks for the comment.